Coping with opiate withdrawal symptoms is no easy feat. There are times when one feels that he would not be able to bear the temptation. At such times, any form of assistance in combating these symptoms can make a world of difference. Among the various options that are available for the purpose is Benadryl for opiate withdrawal. The role of Benadryl with regards to opiate withdrawal is a bit complicated. It is provided with the ability to reduce the withdrawal symptoms including anxiety, insomnia, and runny nose. However, there have been cases where the usage of Benadryl for dealing with opiate withdrawal worsens the person’s RLS. Before you endeavor to make use of Benadryl for opiate withdrawal, it is important that you acquire complete information about it. We are, thus, going to deal with various aspects of Benadryl usage. Let us commence the discussion by going through a brief overview of the actions of Benadryl. We will then move on to discussing the usage. There are certain risks that you need to be alerted against as well. There are alternatives available to Benadryl as well if you do not think it would be safe for usage. 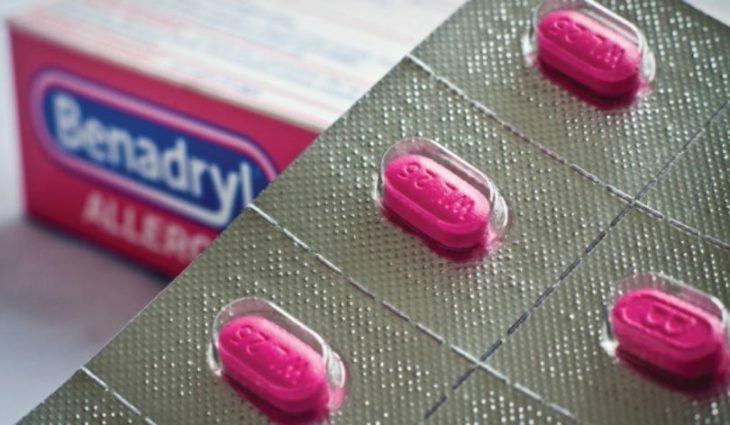 Benadryl is diphenhydramine. It is available over the counter with ease as it is commonly used to deal with allergies. The drug serves to block the effects of histamine in the body. Apart from its antihistamine properties, there are certain other effects that the drug has as well. It is found to be an anticholinergic, which implies that it can inhibit the action of acetylcholine. It is also an antitussive, thereby proving to be of help in relieving coughs. It also works as an antiemetic and can prove to be of value in preventing vomiting. It also functions as a sedative so that one can use it to induce sleep and attain a state of calm. There are many addicts who have managed to attain a great deal of benefit from Benadryl with regards to the withdrawal symptoms that they face such as insomnia. The medication is provided with rather strong sedative effects and is FDA approved to be used as a nonprescription sleeping medication, which is why you can use it without worrying about safety. As has been mentioned before, Benadryl is equipped with anticholinergic effects. Thus, it can exacerbate the Restless Leg Syndrome. There are two types of users for Benadryl that you will find. One section is that which managed to acquire a great deal of benefit from the medication, while the other section is the one that had to face the issue of worsening Restless Leg Syndrome. The dosage for the medication for adults is 25 to 50 mg, which is meant to be taken every 6 to 8 hours. It is important to ensure that the dose is not exceeded beyond 50 to 100 mg within a span of 4 to 6 hours. It is advisable that you make use of the medication under the guidance of your physician. This would ensure that you are able to acquire prompt assistance in case something goes wrong. Endeavor to make use of the least amount of dose that would provide you relief from the symptoms. Strive to ensure that the usage of the medication is restricted to a few days to deal with the severe symptoms. Prolonging the usage can lead to addiction. Make sure that you are aware of the contraindications of the medication. If you maintain an adequate dosage, there is no reason for you to be worried about dependency. It is when the amount is exceeded that the issue of addiction crops up. Although these are just rare cases, there have been reports of people developing an addiction to the medication. They start taking it to attain euphoric effects and as a result, they start experiencing cravings for it. To make sure you don’t reach this stage, maintain a proper dosage. Due to the risk of dependency, people tend to be wary of making use of the medication. In this case, there are certain other supplements available which you can use to deal with insomnia and other symptoms of opiate withdrawal. CalmSupport is a great option. It has been seen that Benadryl usage is viewed as the last option when all else fails. It is meant to deal with the feelings of anxiety and insomnia that arises due to opiate withdrawal. Due to the cases where people have had to experience exacerbating symptoms of RLS, there are quite a few people who are wary of the medication. There are certain alternatives available for the medication as well, which are found to be much safer and are more appealing options. There is no denying that you stand to attain quite a bit of benefit from the usage of this medication. It proves to be of great help in dealing with insomnia, nausea, vomiting and allergic symptoms. However, there are certain risks involved with using the drug as well. Therefore, the decision to make use of Benadryl is one that you need to take after careful consideration. You need to ensure that you are well aware of the pros and cons along with the risks involved.